Jonathan Weinreich Associate Product Manager Enzo Life Sciences. Development of a single drug, whether it is a new chemical entity, biotherapeutic, or genetic/cellular therapy, requires significant investment of resources. Each step of the process—from early discovery through production and delivery—must be fully explored, characterized, and understood to prevent issues resulting from cell stress, cell death, protein aggregation, and factors affecting reliable manufacturing of the drug. ELISAs (enzyme-linked immunosorbent assays) are well suited for contamination monitoring in bioprocess applications. Briefly, ELISAs utilize a matched antibody pair to detect the presence of a specific analyte. In a typical ELISA, a 96-well plate is coated with a capture antibody. The researcher then incubates the wells with the target—some wells receive a known concentration, while others receive samples with unknown concentration. Then, a detector antibody is added, and an enzyme is added to develop color. The optical density (OD) of each well is read at a specific wavelength, and using the OD of the wells of known concentration, researchers can interpolate unknown concentrations. ELISAs are fully quantitative and sensitive, with kits on the market able to detect down to the picogram-per-mL level. Whether one works in drug discovery, upstream, or downstream bioprocessing, there exists a range of ELISAs to help researchers maintain cell-line viability, optimize and monitor product integrity, and maximize yield. In this tutorial, the authors will introduce two markers that are commonly investigated using ELISAs­—Protein A and host-cell proteins (HCPs). 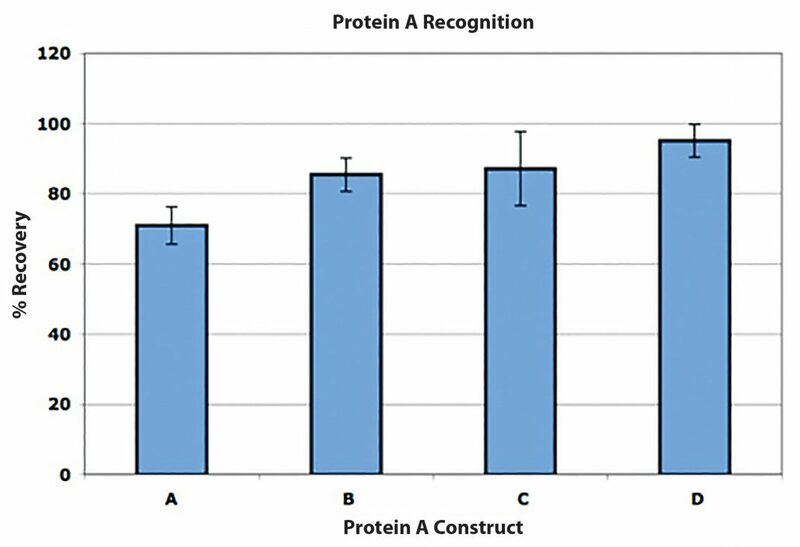 Protein A affinity chromatography has been shown to be highly selective for mAbs, resulting in a purity greater than 95% starting from complex samples (Figure 1). It became the method of choice by achieving high purity and yield in a single unit operation, simplifying manufacturing operations, and reducing times and effort required to develop a purification process. In a typical mAb purification process, the protein-rich supernatant is harvested from hybridoma cells in culture. Then, during Protein A affinity chromatography, antibodies are captured at a neutral pH and eluted at an acidic pH. After the inactivation of adventitious viruses, cation-exchange chromatography is performed to remove HCPs, mAb aggregates, and antibody fragments, followed by anion-exchange chromatography, which removes DNA, leached Protein A, and other contaminants. Following these filtrations, the biologic is ready for use.2 However, Protein A is known to participate in a number of biological functions, including immunogenic, toxic and/or mitogenic activities—thus, the quantification of potential Protein A contaminants from antibody preparations for therapeutic use is necessary. HCPs are a residual contaminant that can appear in the production of a biologic. They are produced by organisms as a side product to the intended protein. While there are many different possible host cells from which to choose, many facilities opt to use Escherichia coli or Chinese hamster ovary (CHO) cells as model organisms (Figure 2). E. coli has been widely studied and its genome and processes are well understood. It constitutes the easiest, quickest, and most cost-effective method of production of protein. 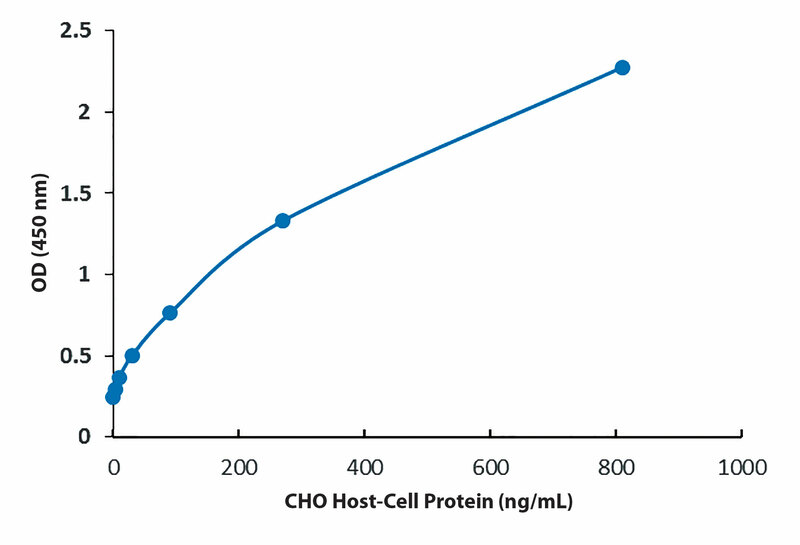 CHO cells are highly efficient, as they can produce recombinant protein on the scale of 3–10 g/L of culture with less variation if long-term protein production is needed. Although HCPs are necessary for natural cellular functions and some may actually be completely harmless, they are sometimes carried through the purification process and considered undesirable to have in the final product. Every year, considerable effort is expended in the industry to remove HCPs from biologic mixes. This is complicated by the tendency of HCPs to be present in very small quantities (usually on the ng/mL scale), making it additionally important to quantify HCP residuals in the production of biologics.3 Many techniques have been developed for HCP analysis, such as gel electrophoresis or Western blot. However, the most commonly used method remains ELISA. Figure 2. Sample standard curve for a commercially available Chinese hamster ovary (CHO) host-cell protein ELISA kit. When pursuing production of a protein, introduction of contaminants is unavoidable. ELISAs are well suited for this problem: they are sensitive and specific, two qualities that allow manufacturing facilities to detect the presence of contaminants. Specifically, ELISA technology is typically used to investigate Protein A and HCP contaminants. When using an ELISA, it is of the essence to achieve a verifiably accurate and precise result; as very often, the entire process will depend on the final purity of the biologic. Jonathan Weinreich (jweinreich@enzolifesciences.com) is associate product manager at Enzo Life Sciences. 1. W.F. Verwey, “A Type-Specific Antigenic Protein Derived from the Staphylococcus,” J. Exp. Med. 71(5), 635–644 (April 1940). 2. A.A. Shukla, B. Hubbard, T. Tressel, S. Guhan, D. Low, “Downstream Processing of Monoclonal Antibodies—Application of Platform Approaches,” J. Chrom. B, 848(1), 28–39 (March 15, 2007). 3. X. Wang, A.K. Hunter, and N.M. Mozier, “Host Cell Proteins in Biologics Development: Identification, Quantitation and Risk Assessment,” Biotechnol. Bioeng. 103(3), 446-458 (June 15, 2009).